Friday is marked on the calendar as our long-awaited first day of spring. 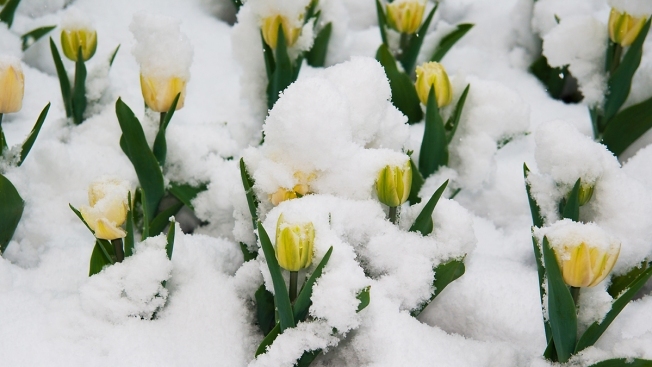 But don't expect the upcoming equinox to bring sunshine and tulips -- instead, the D.C. area will see cold, wind, rain and (gasp!) snow. Before the shivers return, St. Patrick’s Day may not be the only thing worth celebrating this March 17. D.C. temperatures reached 71 degrees at midday Tuesday, for the first time since Dec. 1. Sadly, this sunny reprieve will be brief. A cold front pushed blustery winds into the area Tuesday afternoon. Gusts could reach 40 mph, plummeting Tuesday night and Wednesday morning temperatures into the low 30s. So don't get too comfortable in those light jackets: That's a near 40-degree temperature drop. Wednesday and Thursday skies will remain dry and sunny, but that is not a recipe for warmth; temperatures aren't likely to reach 50. Ironically, Friday -- the first day of spring -- will be the least springlike weather of the week. Cold air and moisture is expected to bring wet snowflakes to the area Friday morning, melting to cool rain throughout the afternoon. A bit of a solace for shovelers: We should not see any actual accumulation. Enjoy the 70-degree weather today (#70orbust!) as it's looking like a wintry start to spring ahead.